VBS Direct Ltd - Trials & Published Studies - Innovative solutions for the veterinary professional. 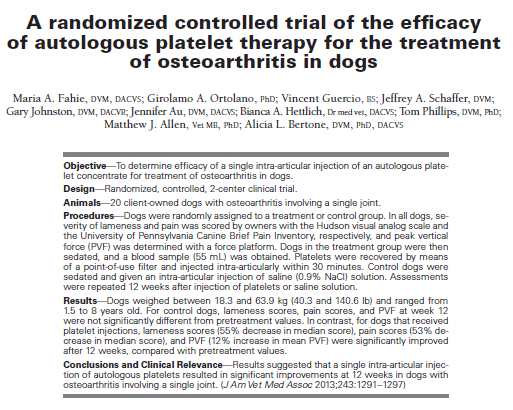 To determine efficacy of a single intra-articular injection of an autologous platelet concentrate for treatment of osteoarthritis in dogs. Randomized, controlled, 2-center clinical trial. For control dogs, lameness scores, pain scores, and PVF at week 12 were not significantly different from pre-treatment values. 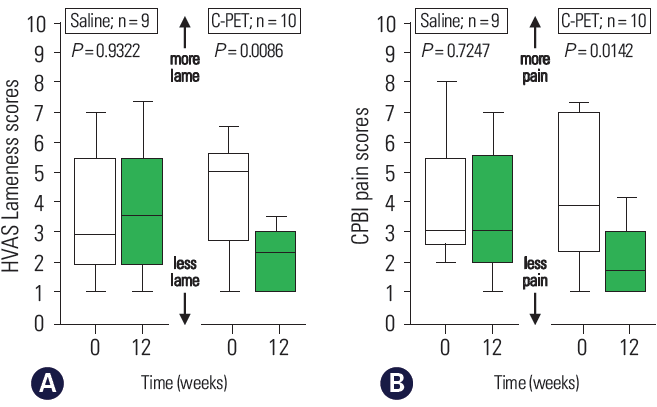 In contrast, for dogs that received platelet injections, lameness scores (55% decrease in median score), pain scores (53% decrease in median score), and PVF (12% increase in mean PVF) were significantly improved after 12 weeks, compared with pre-treatment values. For the study, dogs with osteoarthritis (n = 90) were injected once with platelet concentrate V-PET under veterinary supervision. Directly before and 3 months after treatment, each dog’s lameness parameters were recorded by the owner on a scale of 1 (worst) to 10 (very good) rating.